Fresh peaches and nectarines just say ‘summer’ to me. They star in markets for a couple months and don’t boast near year-round availability, even in California where we tend to be spoiled with long growing seasons. So I get really excited about this juicy stone fruit, for eating out of hand and in recipes. And if you’re reading this in the fall or winter, try thinly sliced Fuju Persimmons instead of peaches. I especially like peaches and nectarines with cheeses like soft goat cheese, Pecorino or Muenster, served with nuts and crackers for a simple summer appetizer. California Tree Fruit Agreement, the marketing board for peaches, nectarines and plums, has some great cheese recommendations and recipes too. Another favorite is this salad with feta cheese, sweet balsamic dressing and spiced nuts. Though there are three parts to prepare, the dressing makes extra so you’ll have a home-made dressing ready for later, and leftover spiced nuts make a great snack. Or, you can easily short-cut by using purchased balsamic dressing and toasted nuts. The peaches star anyway! 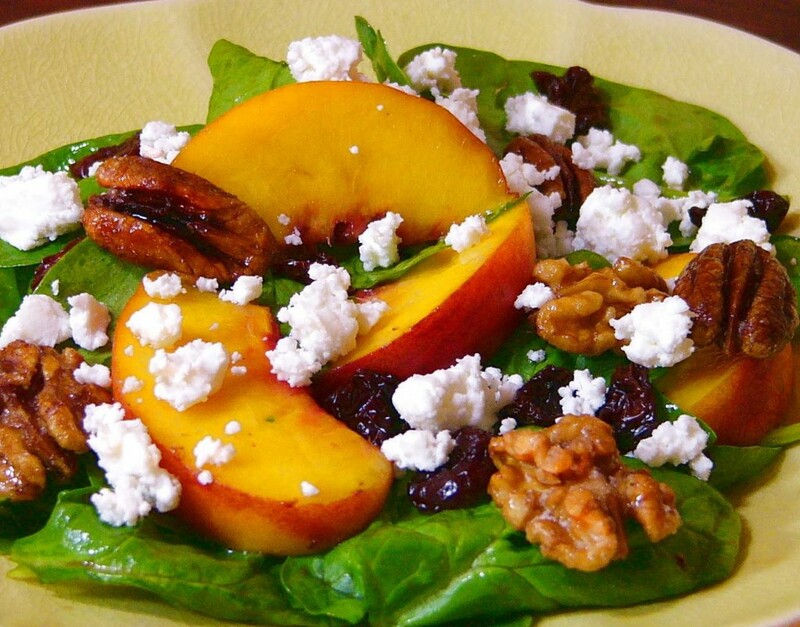 PLACE spinach, peach slices and dried cherries in a large bowl. Add about 3 tablespoons dressing and mix well, adding additional dressing if needed. Divide salad onto plates and top with feta cheese and nuts. MIX sugar, salt, allspice, and cayenne in a small bowl. Bring 2 cups water to a boil in a medium saucepan. Remove from heat; add nuts. Let stand 30 seconds; drain in a colander. Return nuts to saucepan. Stir sugar mixture into hot, wet nuts. Line a baking sheet with foil and coat with cooking spray. Spread nuts evenly onto pan. Bake at 350°F about 15 minutes until toasted and glazed, stirring every 5-6 minutes. Cool. Store airtight. Makes 3 cups. When choosing peaches and nectarines look for an even yellow background color with no green around the stem. They should have a fragrant aroma too. If the fruit seems too hard for your preference when purchased – because it’s nearly impossible to transport fully ripened without damage – store in a closed paper bag at room temperature out of direct sunlight for a day or two. The ethylene gas from the fruit will allow the fruit to naturally ripen and soften. Once ripe, eat right away or refrigerate up to 2 days. Recipe developed by Rosemary Mark for Stella-Saputo Cheese. That looks yummy! Looks like something I would LOVE to have for a light summer dinner – add some grilled chicken and you have a meal! WHAT A COMBINATION OF TASTES! FELT LIKE I HAD RIOT IN MY MOUTH! SOOOOOO GOOD! Hi “Greg likes to eat”! Happy to hear you tried it and liked it. Thanks!